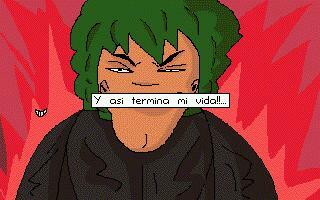 INGLES: This one is a graphical very simple adventure realized in only two days of programming in which we take the control of Cacho, a personage who looks for action and to find her goes out to the street. A simple script for an entertaining adventure. ESPAï¿½OL: Esta es una aventura grï¿½fica muy simple realizada en solo dos dï¿½as de programaciï¿½n en la cual tomamos el control de Cacho, un personaje que busca acciï¿½n y para encontrarla sale a la calle. Un guiï¿½n simple para una aventura entretenida. This was my Lucky Dip pick for the week of 9-15-13. It's a joke game in Spanish. I didn't get the joke because I don't read Spanish fluently. There was a girl kissing a lizard. That's funny. I guess. Well, I played this game. I got stuck on what to do with money. Any hints would be nice, each time I talk to that first guy I Get game over lol. I don't know how to use the computer I don't know if the buttons even work or if theres a code for it. La trama me pareció una copia del Larry... pero bueno, saludos.